1: What Is Yii framework? 2: Why Yii Is So Fast? 3: Yii Versions? 4: What Are the Prerequisites Yii? 5: Why Use Yii 2.0 Framework? 6: What Are the Benefits of Yii over other Frameworks? 7: What's New in Yii Release 2.0? 8: What Is The First File That Gets Loaded When You Run A Application Using Yii? 9: What Is The First Function That Gets Loaded From A Controller? 10: What Are the core components of Yii2 framework? 11: What Are the great feature of Yii Framework? 12: What Are The Application Structure of Yii 2.0 Framework? 13: What Are the Naming Convention in Yii 2.0 Framework? 14: What Is Request Life-Cycle of Yii 2.0 framework? 15: What Are Yii helpers? 16: What Are the Core Helper Classes in Yii Framework? 17: What Are The Server Requirements to Install Yii 2.0 Framework? 18: How To Customizing Helper Classes in Yii Framework? 19: What Are The Directory Structure of Yii 2.0 Framework? 20: How To Create Directory Structure of Yii Framework? 21: What Are the Steps to Install Yii 2.0 Framework? 22: How To Configure Yii Application With Database? 23: How to get current controller name? 24: How to get current action name? 25: Which ORM does Yii2 supports? 26: What Is gii in Yii 2.0 and Why It Is used? 27: What Are formatter in Yii 2.0? What Is name of first file the loaded when Yii 2.0 framework starts? 28: What Are Components in Yii 2.0 framework? 29: How you can write a custom component and use it inside your app? 30: What Is CModel Class in Yii 2.0 framework? 31: What Is Active Record (AR) in Yii framework? 32: What Is Another Controller View in Yii? 33: How Can We Use Ajax In Yii? 34: Can we deploy applications to different servers? 35: What Is Required Properties in Yii Application? Why? 36: How to use module components and aliases? How to access module component? 37:How To Set Home Page Url in Yii? 38: How To get the Get Home Page Url in Yii? The Yii is a pure OOP based framework, free, open source, high-performance, component-based PHP framework for rapidly developing modern Web Applications and the name Yii is pronounced as Yee or [ji:]) means "simple and evolutionary" in Chinese. The Yii is written in PHP and the stable release is 2.0.15.1 at March 21, 2018. The Yii is a PHP framework for rapidly-developing, modern Web applications. Why Yii Is So Fast? The Yii framework is so faster because it is using the lazy-loading technique extensively. The Yii framework currently has two major versions, one is 1.1 and other one is 2.0. What Are the Prerequisites Yii? Which PHP version is required to install Yii 2.0? The Yii 2.0 Framework requires PHP 5.4.0 or above and runs best with the latest versions of PHP 7. Why Use Yii 2.0 Framework? The Yii 2.0 Framework helps you to create modern web applications quickly, and make sure they perform well. What Are the Benefits of Yii over other Frameworks? The Yii framework is a generic Web programming framework and it used for developing all kinds of Web applications quickly using PHP and It also very suitable for developing large-scale applications. The primary goal of Yii or Yii 2.0 framework is - high performance. The Yii framework is a full stack framework and ready-to-use features for both the relational and NoSQL databases. 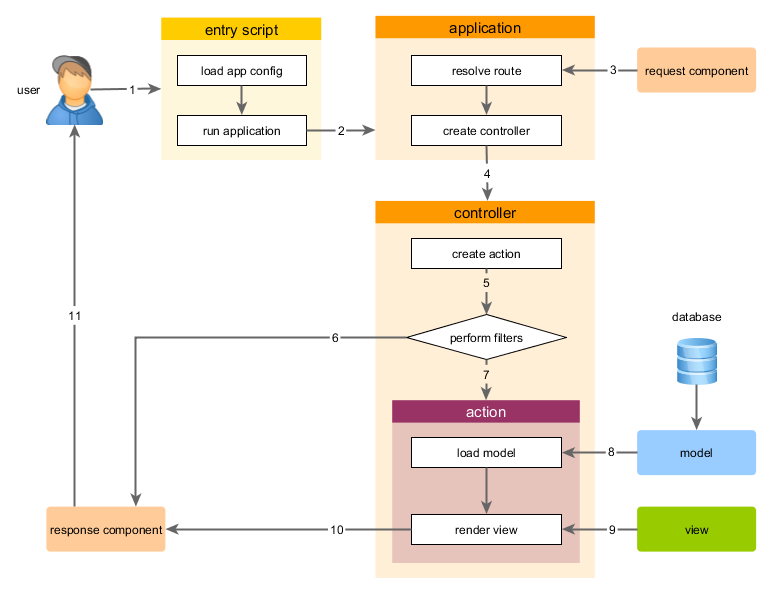 The Yii framework implements the MVC (Model-View-Controller) architectural pattern. The Yii framework is extremely extensible. The Yii framework contains the Larger Community and it also purchased an unlimited license to the beautiful web-based rich text editor and Redactor. What's New in Yii Release 2.0? The Yii 2.0 framework support for PSR-4 class auto loading, simpler namespaces, faster loading, and improved usability for developers. The Yii 2.0 framework added performance and security improvements. The Yii 2.0 framework added RESTful API integration. The Yii 2.0 framework added improvement on URL handling and processing. Now Yii 2.0 framework, Translations of core messages available in 26 languages. What Is The First File That Gets Loaded When You Run A Application Using Yii? index.php: This file loaded first when we Run an Yii application. What Is The First Function That Gets Loaded From A Controller? index : This is the first function that gets loaded from a controller. What Are the core components of Yii2 framework? What Are the great feature of Yii Framework? What Are The Application Structure of Yii 2.0 Framework? What Are the Naming Convention in Yii 2.0 Framework? The Yii 2.0 Framework uses a simple standard to set names. The ModuleID must be specified in the module's configuration property, under the same name. The ControllerID and ActionID should contain only English characters in lowercase, digits, underscores, dashes, and forward slashes. The r : refers to the route. What Is Request Life-Cycle of Yii 2.0 framework? The action loads some data models, possibly from a database. The action renders a view, providing it with the data models. The Yii Framework provides different types of classes that help you to simplify a common coding task, such as string manipulations, array manipulations or HTML code generation. In Yii Framework, all helper classes are static classes and all helpers are kept under the 'yii\helpers' namespace. What Are the Core Helper Classes in Yii Framework? What Are The Server Requirements to Install Yii 2.0 Framework? How To Customizing Helper Classes in Yii Framework? To customize a core helper class, we should create a new class extending from the helpers base class. What Are The Directory Structure of Yii 2.0 Framework? How To Create Directory Structure of Yii Framework? We can use the below commands for Creating Directory Structure. What Are the Steps to Install Yii 2.0 Framework? To install Yii Framework, you need to following below steps. Step 1: Download the Yii code from its official website or github. Step 2: Extract the code into your server root directory. Step 3: Open command line terminal and type the following command. Step 4: After execution of above command, it will ask you for the confirmation of creating your application, on selecting yes, this will create a default application. How To Configure Yii Application With Database? findAll() Method : Find the users whose primary key value is 20. How to get current controller name? How to get current action name? Which ORM does Yii2 supports? Active Record, it provides an object-oriented interface for accessing and manipulating data stored in databases. What Is gii in Yii 2.0 and Why It Is used? What Are formatter in Yii 2.0? What Is name of first file the loaded when Yii 2.0 framework starts? [[yii\i18n\Formatter::asEmail()|email]] - the value is formatted as a mailto-link. [[yii\i18n\Formatter::asImage()|image]] - the value is formatted as an image tag. [[yii\i18n\Formatter::asUrl()|url]] - the value is formatted as a hyperlink. What Are Components in Yii 2.0 framework? How you can write a custom component and use it inside your app? Step 3: Add your component inside the config/web.php file e.g. Step 4: Now you can use your component method "welcome" inside any of your app controller actions. What Is CModel Class in Yii 2.0 framework? Yii CModel is the base class that provides the common features needed by data model objects.CModel defines the basic framework for data models that need to be validated.All Models in Yii extends CModel class. What Is Active Record (AR) in Yii framework? What Is difference between “render” and “renderpartial” in Yii Framework? The render() is commonly used to render a view that corresponds to what a user sees as a "page" in your application. The render() partial we can add some portion of code in another file. The renderPartial() is commonly used to render a "piece" of a page. The render(‘myview’) will render the file ‘myview’, complete with the $layout that’s specified in your controller. The renderPartial(‘myview’) will render ONLY the contents for ‘myview’. And you can use it with special keys to return result in variable and to echo this html where you want. Render() we can add whole file in another file Example : The render() is used to display page with layout or theme. What Is Another Controller View in Yii? How Can We Use Ajax In Yii? Can we deploy applications to different servers? Yes! We can, because we store each application in a separate directory, if needed, we can deploy them to different servers. What Is Required Properties in Yii Application? Why? basePath: The basePath property specifies the root directory of an application. Example for $basePath public property: The root directory of the module. How to use module components and aliases? How to access module component? If you have placed your components in modules then. How To Set Home Page Url in Yii? How To get the Get Home Page Url in Yii? How to change the existing style of Yii pagination?